When adults hear the word “exercise,” some very distinct ideas come to mind. Running, lifting, pilates, squeezing in a trip to the gym after work—you get the idea. But for kids, exercise means some very different things. It’s playing tag with their friends in the backyard, throwing a frisbee at the park, going for a swim, taking their dog for a walk, riding bikes—in other words, exercise means having fun! Which is good news, because fun is a sure-fire way to get kids moving. And we can’t think of many other things that are more fun than the Octopit USA gaga ball pit. But more on that later. 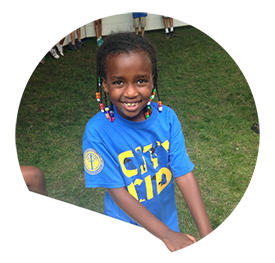 Let’s take a closer look at why it’s so important to provide kids with opportunities for exercise (and fun). Exercise is incredibly important for children, particularly while their bodies, minds, and motor skills are still developing. There are numerous studies that have shown that exercise strengthens the body, helping the heart, lungs, muscles, bones, and even the brain function at higher levels. Some studies have also indicated that children who participate in more aerobic activities perform better at tasks that require more concentration and attentional control. Gaga ball helps to perfect agility. Because the court is limited to an area that is relatively small compared to a full-sized gym or football field, it requires smaller and quicker movements. Gaga ball sometimes requires a quick change of direction, which requires maintaining balance, speed, and body control. These skills will prove valuable later on when children begin to participate in other types of extracurricular activities. It also contributes to the development of coordinative abilities in that it requires several types of movement and control all at once. Sports and activities like gaga ball also develop various types of coordination. Coordination is beneficial to the body, allowing muscles to work together to do what they need to do when they need to do it. Activities like running help to develop gross motor skills, those actions that utilize larger muscle groups, while hand-eye coordination is developed by intercepting the ball. Being able to manipulate the ball to get other players out also involves a certain degree of fine motor skills. All of these types of coordination are important skills to master, as they will be crucial to performing various tasks throughout life. Improved heart health: Cardio makes the heart work harder to pump oxygen throughout the body. Exercising the heart in this way makes it stronger which is definitely a good thing in most cases. Increased metabolism: Several studies have shown that cardio can also have a positive impact on the regulation of the metabolism, which means that the body is better able to maintain a healthier weight. Burning calories and energy: Cardio is a great way to burn off some of the calories that the body takes in throughout the day. And since many kids’ diets consist of sugary drinks and foods, this is a needed benefit. It will also burn off energy! Kids sit for long periods of time at school with very few outlets for that energy. When kids can’t find an outlet, they can become temperamental and have difficulty focusing. A few rounds of gaga ball can go a long way towards relieving some of that tension. The gaga ball pit from Octopit USA provides a fun and safe environment for kids to have fun and get some important exercise time. Exercise is important for young kids in a variety of ways. It helps their bodies grow strong and healthy, helps them focus better, and also establishes healthy habits they will need later in life. With easy set-up and take-down and durable materials, the Octopit USA gaga ball pit can be be used indoors or out, giving schools, churches, and other organizations an affordable and versatile investment for the health of their students. 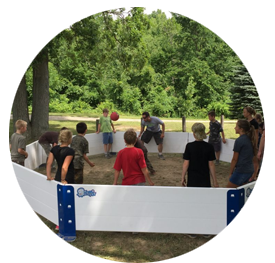 To learn more or to order your own gaga ball pit, contact us today!